1 pc. 21,76 EUR ea. from 3 pcs. 19,27 EUR ea. from 10 pcs. 17,04 EUR ea. from 20 pcs. 15,96 EUR ea. from 40 pcs. 15,00 EUR ea. 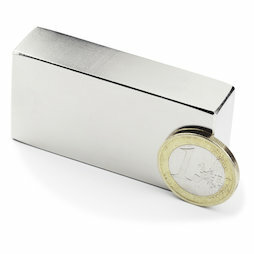 With an adhesive force of over 50 kg, this block magnet is one of our strongest magnets. Its adhesive force bridges several centimetres of distance, e.g. through a thick book. 1 pc. 11,25 EUR ea. 1 pc. 11,71 EUR ea. 1 pc. 12,01 EUR ea.